Blondie and Brownie: Standing Order Concrete, the Four-Month "Today's Special"? 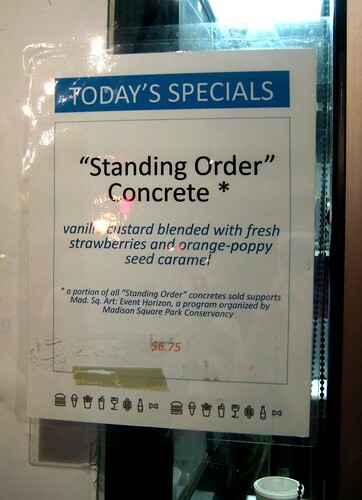 Standing Order Concrete, the Four-Month "Today's Special"? Friday was lovely, wasn't it? Before the rains of Saturday morning, the wind of Saturday afternoon, the fallen power lines of Saturday night, and the chilly bite of Sunday. On Friday, the weekend seemed so full of spring, enough so that a little post-happy hour Shake Shack meal of custard and beer wasn't a crazy ridiculous notion. Neither is orange-poppy caramel and strawberries. While waiting in line for a scoop of the salted caramel custard, a "Today's Special" sign caught my eye. Now, I know that the Shack likes their specials, and more often than not, a "Today's Special" may mean "Today's Special On-And-Off When We Feel Like It Until We Don't Feel Like It Anymore." Said "Today's Special" the "Standing Order Concrete" contains vanilla custard mixed with real fresh strawberries and orange-poppy custard. Poppy in custard provided one of the odder, yet completely enjoyable, food textures I've ever had, and the entire concrete is awesomely delicious. But since this special had some of its proceeds going to support Event Horizon by Antony Gormley-you know, the cast iron statues positioned on top of buildings and freaking everyone out-does this mean that the "Today's Special" concrete will be going on until August, when the exhibit ends? Ms. Robobby has a photo of the concrete being served back in the beginning of April. If you see this being offered, now that 1) it's a do and 2) it's not a given that you will see it again so you should eat it now! Salted Caramel custard should also be on your eat this now! list especially if you're a lover of the caramel. 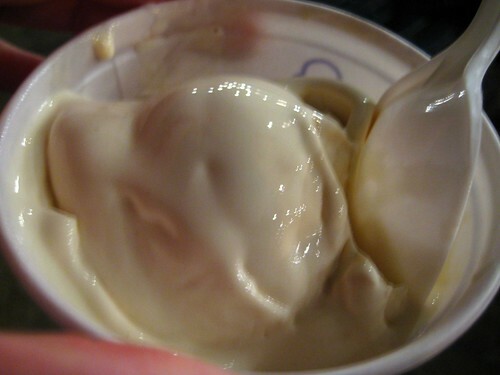 We, Bez and I, loved the perfectly sweet caramel goodness, but would have liked maybe some sea salt on top of the custard. 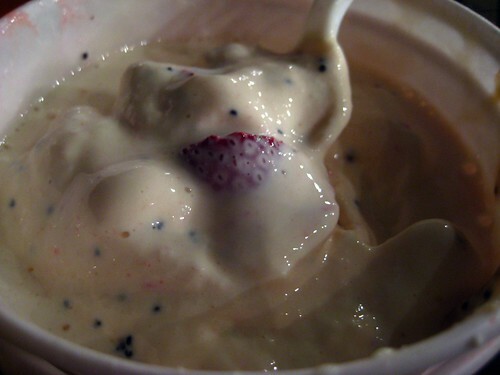 A little crunch, a little salty, but not enough to lower the chemical make-up and have this be a custard fail. I don't know why they're not making the "Standing Order Concrete" with this custard, that just seems like a missed opportunity at greatness. Salted Caramel custard is available on Fridays through May.